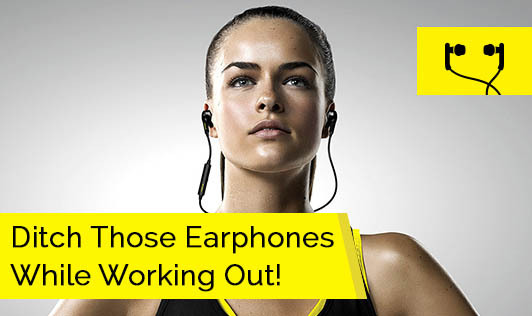 Ditch Those Earphones While Working Out! The main reason for the use of earphones during a workout is motivation. Music gives us a boost of power and energy required for the exercise. But did you know that the use of earphones during a workout could be more dangerous than using them for a prolonged period of time when not working out? According to a study conducted by the University of Nevada- Reno, it was found that prolonged use of stereo headphones, particularly at loud volumes could cause hearing loss. Loud noises trigger the production of adrenaline in the body. This adrenaline rush causes a constriction of blood supply to the ears and diverts it to the arms, legs and heart as a part of the body's ‘fight-or-flight' response. The blood supply during aerobic exercise is diverted from the ears to the extremities due to the increased nutrient and oxygen requirement of the working muscles. Although both aerobic exercise and loud noise divert the blood supply from the ears, both together will result in quicker and more damaging results, including loss of inner-ear hair cells or cilia that help transmit vibrations. 1. Ringing or buzzing in the ears. 2. Difficulty hearing speech in background noise. 3. Failure to hear high frequency sounds like chirping of the bird. Another reason to stop wearing earphones while jogging, running or cycling on the road is to avoid accidents and collisions with other runners or vehicles. 1.While exercising indoors, use speakers instead of earphones. 2.Have company while working out. This will motivate you and keep you from getting bored. 3.While exercising outdoors, listen to the sounds around you. Appreciate the sounds of nature. Well, it's time to say goodbye to hearing loss by ditching those earphones!